All processes within the company are covered by the Quality Management System. 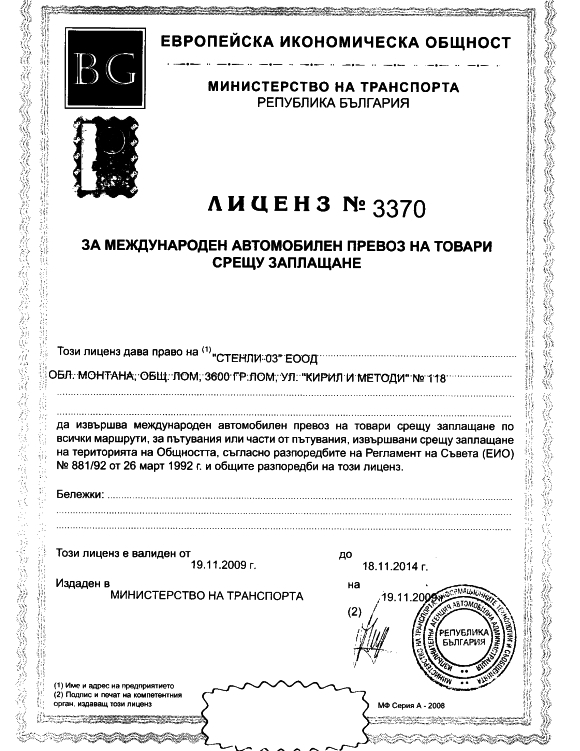 The company was first certified on 07 February 2007. Over the years the system has been extended and improved and now covers a large scope of services. Today the scope of registration covers: Construction, repair and maintenance of high, medium and low voltage electric grids. Construction of internal and external electrical installations, street lighting. Construction of photovoltaic parks. Construction and repair and construction and mounting services. 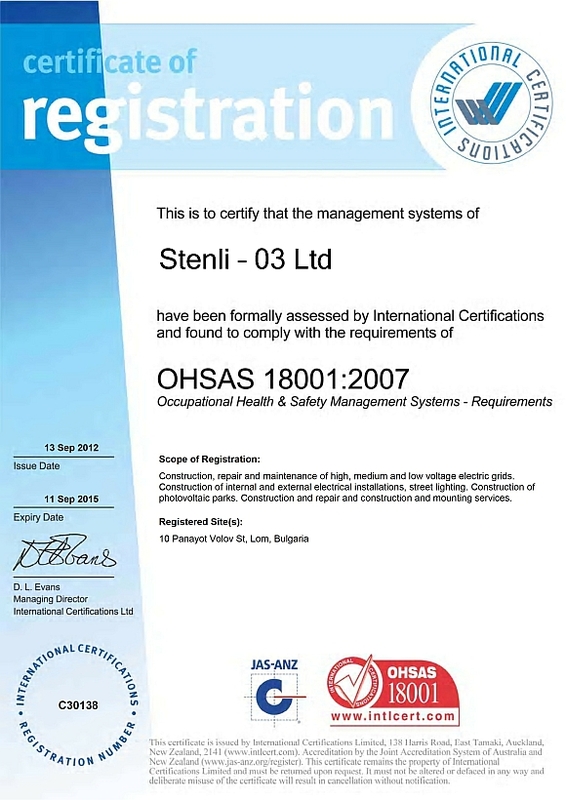 Within STENLI has been established a well documented system for maintaining the key competences of the employees. This deals with the specific safety requirements of each project that the company undergoes and also provides the ability to control the competences of the staff before, during and after commencement of work. The OHSAS system is integrated with the Quality Management System and today the scope of registration covers: Construction, repair and maintenance of high, medium and low voltage electric grids. Construction of internal and external electrical installations, street lighting. Construction of photovoltaic parks. Construction and repair and construction and mounting services. 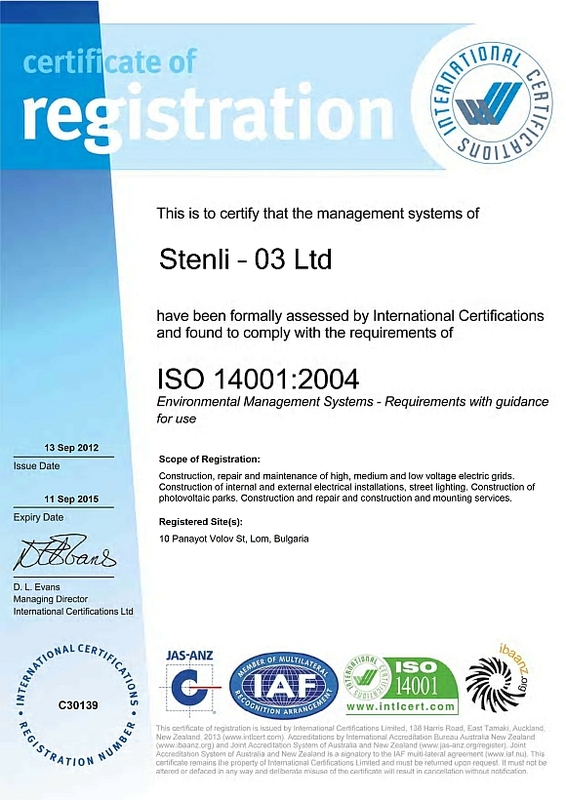 While the company's Mission and Vision is concentrated on renewables and energy efficiency it is only natural that we at STENLI are always striving to protect the environment from the negative impact of construction processes. A respectful Environmental policy is adopted and environmental protection is strictly observed on our project. The EMS system is integrated with the Quality Management System and the Occupational Health & Safety Management System and today the scope of registration covers: Construction, repair and maintenance of high, medium and low voltage electric grids. Construction of internal and external electrical installations, street lighting. Construction of photovoltaic parks. Construction and repair and construction and mounting services. 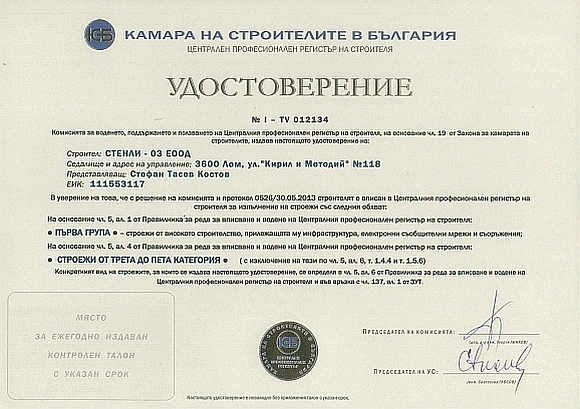 This certification serves as a legal permission for Construction of residential, public and industrial buildings along with all relevant infrastructure, communications and equipment; Construction of public buildings or facilities with capacity between 200 and 1000 visitors; Construction of production buildings or facilities with capacity between 100 and 200 work places; Communication networks and equipment on national backbone level including base stations. 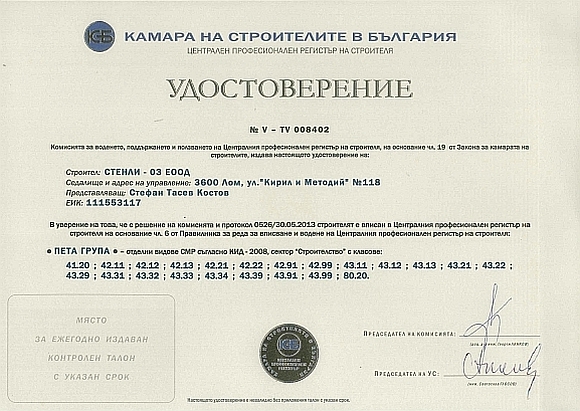 This certification serves as a legal permission for Construction of transmission and distribution lines for energy, heating and gas along with all relevant equipment; Construction of power and thermal stations with total capacity over 100 MWs; Other projects from the energy infrastructure which may require special permission. 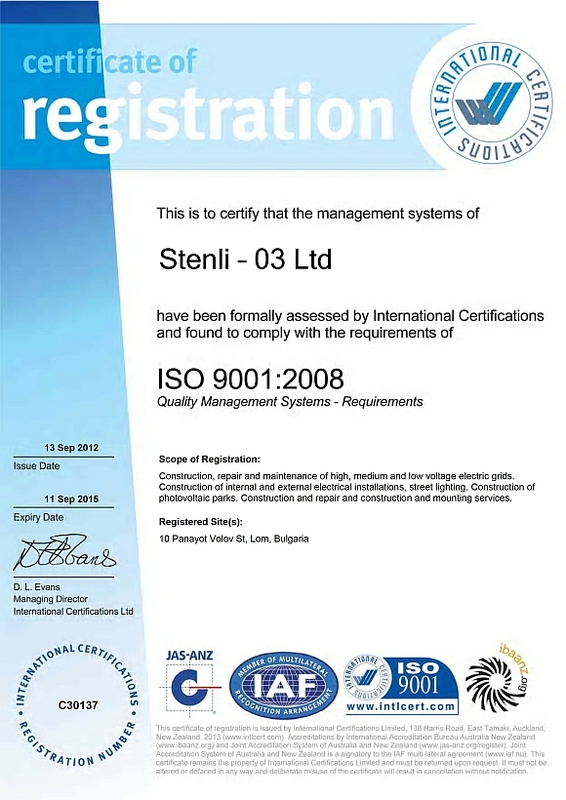 This license allows STENLI to provide international transport service by road on all international roads or part of international roads covered by the European Economic Community in exchange for payment.